As you could read on the front page, we are excited and happy that our studio is able to continue development for Cross of the Dutchman. There will be quite some changes in comparison to the original design plan. Luckily, most changes will improve the game, like the change we’ll talk about today: Pier himself gets a complete overhaul! In order to get to know more about the newly designed protagonist, we asked our artists Pascal Brander and Ronald Houtermans a couple of questions. So you started working on Cross of the Dutchman again. Excited? Of Course! It took a whole lot of blood, sweat and tears to build the demo and it really sucked that we had to halt all production on it. So when we heard the news that we could start development again, it was awesome. This opportunity also means we get to streamline some stuff we encountered building the demo, so it’s all for the better! Why did you decide to change Piers appearance? What was wrong with the old model? When playing the demo, one of the problems we faced was that Grutte Pier didn’t really feel… “grutte (great)” enough. His character design felt a little too light on his legs and didn’t communicate the way we wanted. 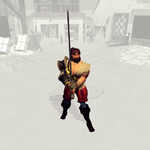 Because you see, Pier was a huge brute, slaying his enemies with ease. So when we started development again, one of the first things we wanted to do was redesign Pier. No major changes, he remains the rugged bearded man he was, just a lot more built as a real farmer with brute strength. Loads of new designs were made. We picked the one on the right. (Pascal): I started by analyzing the current model and write down what was wrong with it, after that I draw a couple of different body types in a more realistic style, while keeping in mind the human anatomy and stretch and deform it in places where it was needed. When I was happy with his “naked” body (say what!? – editor) I designed a couple of different outfits and hair/beard styles. A couple of us voted for the best outfits and we mixed and matched some parts. The funny thing is though, that we ended up with a look that was almost identical to the old design. I guess we did something right after all. When the design was final, Ronald had the job to translate the design to 3D. Our first Pier model was straight low-poly, which meant I had to paint all of the details on his clothing and such. To put it simple, our model ended up being too flat and not interesting enough. This time he went for a high-poly model, where he could model in all of the details. With the high detail model finished you can bake all the important details into a lower detail model which will actually ‘run’ in the game. This process also helps with material definition, like the metal shoulder plates and the leather and cloth he’s wearing. We’re still designing a new sword with the same principles, making sure the materials are much more convincing. The baked result is then ready for Pascal to texture. After that, it’s time to make the character come to life! Which basicly means animations. This is always the most time consuming part of production for artists, it’s a lot of trial and error ‘till you get something cool. What is interesting about creating a character like Pier? Several reasons really. Designing a character who is both good and evil at the same time is always a challenge. He was a simple farmer, a family man. But at the same time, he turned into a fearless killing machine. 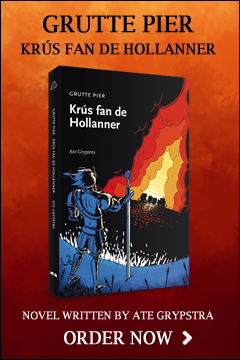 He was a hero to the Frisian people, but he was a villain to the Dutch. These extremes create an interesting contrast and it is a challenge to convey those two aspects into one character. The other reason is, a lot of people already know who he was because of his appearances in television series, old paintings, drawings, and writings. Because of that, a lot of people already see Grutte Pier in a certain way. So to create a design that is acceptable, believable, and recognizable as Pier, was one of the challenging aspects of the process. Looking at old drawings and painting from the same era really helped with the design of his clothing and hair/facial hair style. Can you tell us something about animations? 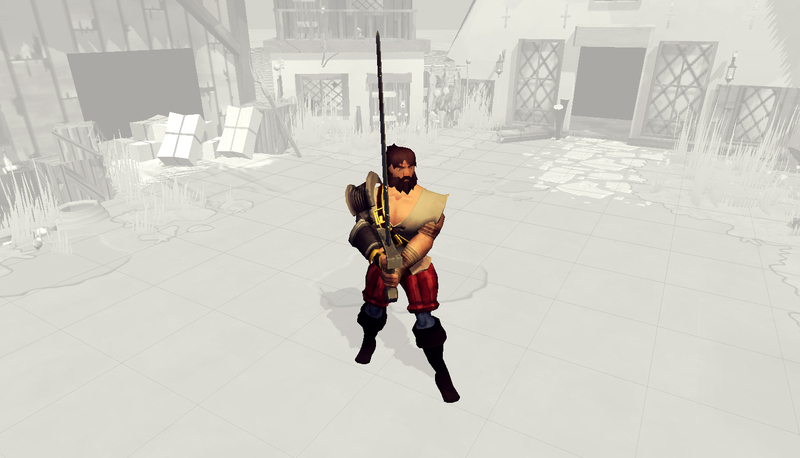 When changing the model we also discarded all of the animations. The motion capture data we had was really, really cool to look at, but it just didn’t work ingame. It felt weak and slow and wasn’t what we aimed for. So we decided to go back to square one, we analyzed other action games and came up with a really cool new system with really powerful animations. They might not be entirely era correct, but it works like a charm! 3D models of the new(left) and the old (right) Pier. We can really give the player the feeling of being a brute now, being bigger and stronger than anyone else. And that’s what we’re really going for and what this game needs. So every change we made is for the better. Are you happy with the result and why? Yes, we are! 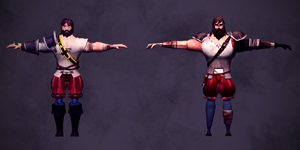 All the changes we’ve made so far ended up being huge improvements and I can’t wait to start working on the actual gameplay to see him run across the fields chopping Dutchmen to pieces! That’s a huge improvement, Pier has a lot more expression now. If you are not changing this, I don’t care. It is just a suggestion. I shall buy this game for any price, any way it looks like. I BUY IT!! !